When building a new house or retrofitting an older one, tunnel fan selection is one of the most, if not the most important decision a producer has to make. A house’s fans are essentially the engine of the ventilation system and as a result have a significant effect on a producer’s ability to maintain the proper environmental conditions throughout the year. Furthermore, with rising electricity prices, selecting the right energy-efficient fan can save a producer thousands of dollars a year. As a result, when selecting fans it is crucial that a producer compares fans not just on initial cost, but on fan performance and operating costs as well. The University of Illinois BESS Laboratory website is the leading source for agricultural fan performance data (www.bess.uiuc.edu). Along with a fan’s air-moving capacity at various static pressures, BESS Laboratory provides producers information on a fan’s energy-efficiency rating (cfm/watt), air-flow ratio (an indicator of how well the fan holds up under high static pressures), shutter location/type, motor model number, fan speed, and a variety of other potentially valuable details. When selecting a tunnel fan it is crucial to know the maximum static pressure the fans will be operating under. The higher the static pressure, the lower the amount of air moved by the fans, and the greater the number of fans required to provide the necessary amount of fresh air/wind speed to keep the birds cool during hot weather. For broiler houses, the maximum static pressure typically ranges between 0.10" and 0.20". Though factors such as pad area/maintenance, deflector-curtain installation, and tunnel door installation/operation will have an effect on the maximum operating static pressure, the primary factor which determines the maximum expected static pressure is air speed. The higher the target air speed, the higher the static pressure will tend to be due to the exponential relationship between tunnel air speed and work (static pressure) required to pull air into and down a house. Table 1 illustrates the typical pressure range the tunnel fans will experience under various design air velocities. The actual maximum pressure experienced can vary significantly with the aforementioned variables as well as house length, fan maintenance, and house tightness. 500 ft/min 0.09" - 0.12"
600 ft/min 0.12" - 0.15"
700 ft/min 0.15" - 0.18"
800 ft/min 0.18" - 0.21"
Table 1. 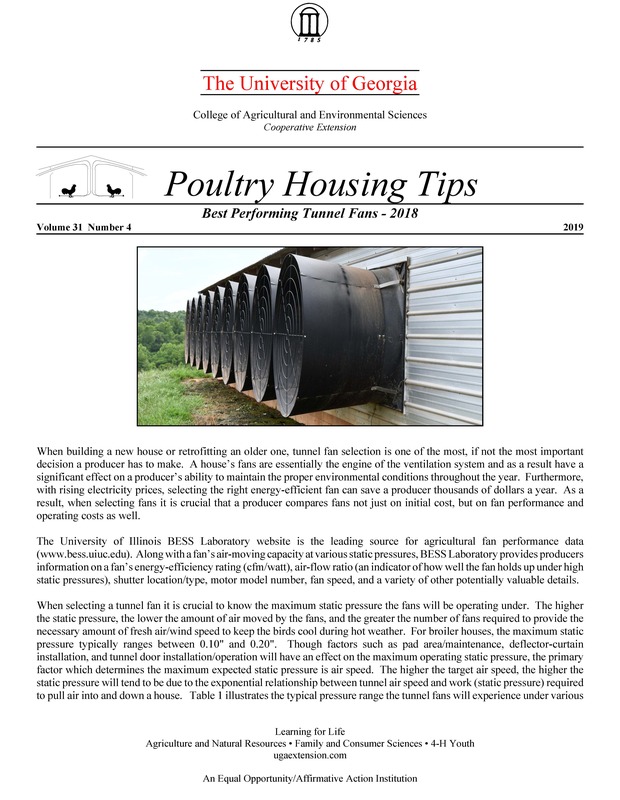 Air velocity and corresponding design static pressure for a traditional tunnel-ventilated broiler house. A fan’s energy efficiency rating is similar to a car’s mileage rating. Instead of speaking in terms of miles per gallon, when comparing fans we look at how many cubic feet per minute the fan can move with a single watt of power (cfm/watt). As with a car’s mileage rating, the higher the cfm/watt the more energy efficient the fan. A 2 cfm/watt difference between two fans typically results in approximately a 10% difference in electricity usage. In general, energy-efficiency ratings vary from approximately 15 cfm/watt to over 30 cfm/watt. As with the case of a fan’s air moving capacity, comparing fans’ energy efficiency ratings should be done at a static pressure of 0.10". A fan’s air-flow ratio is another important factor to consider when purchasing a fan. A fan’s air-flow ratio is an indicator of how well the fan will hold up as static pressure increases due to factors such as dirty shutters, dirty pads, or the presence of baffle curtains. A fan’s air-flow ratio is determined by dividing how much air it moves at 0.05" by how much air it moves at a static pressure of 0.20". The higher the rating the less the fan is affected by high static pressure. Air-flow ratios typically vary from 0.50 to 0.85. To put this into perspective, the air moving capacity of a fan with an air-flow ratio of 0.50 will decrease as much as 50% in a worse case scenario (a static pressure of 0.20"), whereas a fan with an air-flow ratio of 0.85 would decrease only 15%. Table 2 lists the top performing tunnel fans (48" to 62", 230V/Single phase, 60 hz) based on the published test results produced by the BESS Laboratory through December 31, 2018 The fans in Table 2 have an energy-efficiency rating of at least 20.8 cfm/watt @ 0.10" static pressure and have an air-flow ratio of at least 0.76, representing approximately the top 10% of all tunnel fans tested by the BESS Laboratory. Though fan performance is of course very important, it is important to keep in mind that there are other factors to consider when purchasing a fan, such as quality of construction, local dealer reputation, warranty, and type of shutter. Though it can be difficult balancing all the factors when it comes to purchasing fans for a tunnel-ventilated house, in the long run you will find that it is time well spent.